When you’ve just started your apartment search, what’s the first thing you want to know about? The answer is that it depends on the person. Some are concerned about the location, wanting to be as close as possible to the place where they work. Others want to know how much space they’ll have and what the amenities look like. Today’s blog is for another category of wonder-ers–those who wonder what the floor plan looks like and what types of layouts are available. The good news for those people is that if you’re looking for apartments for rent in Littleton, we offer a number of great floor plans. Whether you’re in the market for a 1-bedroom apartment, a 2-bedroom apartment, or even an apartment with loft space, we have you covered! In today’s post, we’ll take a deeper look at the floor plans available here at Summit Riverside Apartments. Keep reading to learn more. 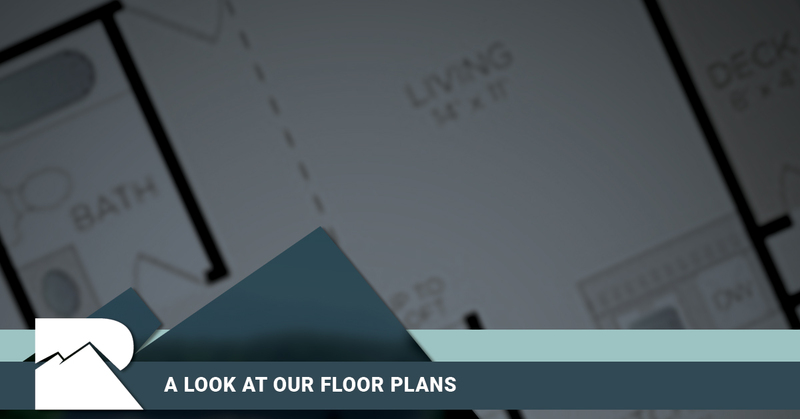 First of all, we’d like to point out that you can head on over to our floor plans page to see layouts and photos of what each of our apartments looks like. In short, if you’re a visual person, the above page is the one for you! On the other hand, if you prefer written descriptions, we’ll have those below. A 600 square foot studio apartment with a bedroom and a loft space, the Crystal layout is ideal for those looking for a cozy space to call their own. Not everybody needs a ton of space, and for those people, this layout is the perfect option because it provides you with exactly what you need to live a minimal lifestyle without sacrificing on style. A traditional 1-bedroom, 1-bathroom apartment, the Rio layout also clocks in at right around 600 square feet. If you’re the type of person who appreciates having a separate space for a bedroom, this is the option for you. There’s even a deck attached to the living room so you can enjoy some time outside. This 726 square foot apartment is also a 1-bedroom apartment with a single bathroom, but it offers a bit more space to stretch out in. With a designated dining area and a deck, it offers everything you need to feel right at home. A slightly different layout and about twenty more square feet make the Rio Grande another great option if you’re looking for a 1-bedroom apartment for rent. This apartment also features a loft space and a deck just off the living room. A 990 square foot apartment with two bedroom and two bathrooms, the Colorado is a great option for those needing a bit more space without sacrificing on style. A deck that’s located just off the living room ensures that you and your roommate can enjoy the great outdoors. A large apartment featuring 1 bedroom plus a loft space, the Eagle layout is a wonderful option for those who need a bit of space to truly feel comfortable. It also features a deck area as well as large closets and a skylight. 2 bedrooms, 2 bathrooms, and a loft space totalling 1,158 square feet make up the Platte layout. If you’re looking for the best apartments with the most space, the Platte is hard to beat in terms of coziness and comfort in one package, making this an incredibly popular layout with our tenants. With 864 square feet split between two bedrooms and one and a half baths, the Poudre layout also features a deck. This particular layout is ideal for those with families who are looking to be close to their kids without feeling cramped. Just Starting Your Apartment Search? At Summit Riverside Apartments, we offer a number of great amenities including stainless steel appliances, full-size washers and dryers, designer flooring, plush carpeting, patios and balconies, fireplaces, walk-in closets, central heating and air, and more. If you’re looking for the best apartments in Littleton, we think that ours are hard to beat. Our community amenities include a clubhouse, 24-hour fitness center, basketball court, playground, internet cafe, outdoor heated saltwater pool, barbecue grills, and controlled security gates, among other things. In other words, there is a lot to love about living here! We strive to offer the best luxury apartments in the area and between living in such a beautiful city and enjoying time in our apartments, we think that you will truly enjoy life here. We are also a pet-loving community with many nearby dog parks and natural areas for you to enjoy and explore. If you’re interested in taking a look, we’d love to show you around. Contact us today to schedule a tour and see for yourself just how great it can be to live at Summit Riverside Apartments. We look forward to hearing from you.